Hummingbirds are birds native to the Americas and constitute the biological family Trochilidae. They are among the smallest of birds, most species measuring 7.5–13 cm in length. The smallest extant bird species is a hummingbird, the 5 cm bee hummingbird weighing less than 2.0 g.
Say hello to the rufous-tailed hummingbird. This female is sitting in her tiny nest. Males look similar—lots of green, just like the females, but they have a bit more glitter on the throat and breast. Both sexes have a reddish-brown (rufous) forked tail—hence the name. 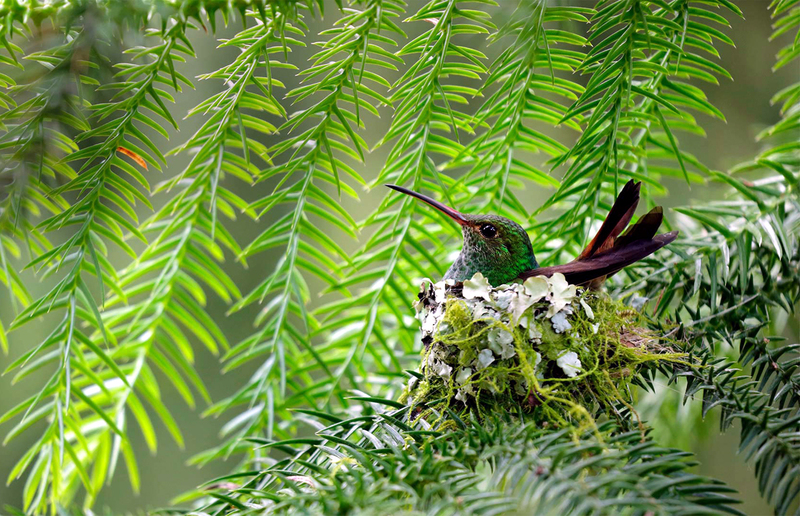 Rufous-tailed hummingbirds are found in forests, gardens, and coffee plantations from southern Mexico down into South America, and they play an important role in pollination. Not to be confused with the smaller rufous hummingbird, which migrates through North America, the rufous-tailed is medium-sized and, like most hummingbirds, is very territorial when it comes to protecting its favorite feeding spots.